This has been a very busy week for us. I (Tyler) honestly turned around to the artists behind me when I was putting together the Top Tenish, and said, “Wait, how is it Friday already! ?” The reason for the apparent loss of time has simply been due to how busy we’ve been this week. I’ve been part of so many conversations involving Design, Art, and Engineering, it’s felt like one minute someone asked about VFX, the next minute a question on the terrain editor, which was followed by “how should we support earrings?” Much of the work we are doing now is a combination of new features and functionality, plus tons of planning for those new features. On top of that, in my specific case, I’ve been focused on character art and animation, specifically nailing down improvements and documenting everything. We’re in a good place: We know what we want to improve and how to improve it–we just need to get the work done, so we can move forward with lots more character art and animations! It’s difficult, but really rewarding. Game development attracts people who like to solve problems, and we have a studio full of those people! If you missed our weekly stream today, you can catch that HERE. Mark ran through our Top Tenish as well as a bit of Q&A. If you have any burning questions that need answering, jump on our forums HERE, or join us on our live streams! We’ll also be running a test this weekend for IT, Alpha, and Beta 1 Backers. Expect a separate email with that info. For the week’s highlights – On to the Top Tenish! Tech – Ability Builder and System Improvements: For Ben and several of the engineers, this week has been full of meetings and discussions about how to better support the creation of the classes and skills we need to have in CU. When this process is complete, the ability builder will return! 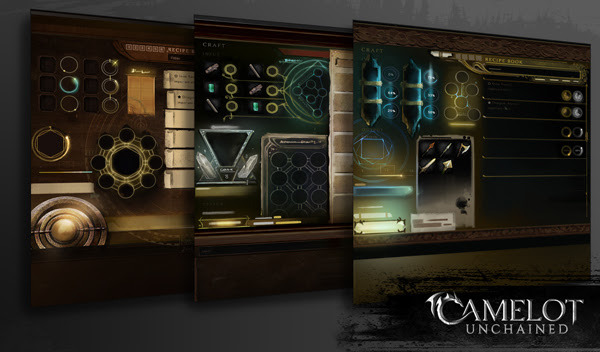 One of the other goals here will be major improvements in the time it takes to create all the classes, skill components, and ability assets for Camelot Unchained. Doing this will also make it easier to debug issues in skills. Tech – Coherent: The first and second passes on the Coherent integration have landed! We have Coherent rendering the loading screens in-game. We have the rest of the UI as well, but that’s currently turned off as we upgrade the data bindings and UI to match. WIP – Tech – NPC Pathfinding: We’re currently investigating the use of a third-party library for navmesh generation, spatial reasoning, and pathfinding for our NPCs. The end goal is NPCs that can actively contribute to gameplay in a positive way, and not be dumb as rocks (and we are probably underestimating the comparative intelligence of rocks). WIP – Tech – Disc Shape Directional Lights and Sound LODing: Dave has mostly wrapped up the lighting task that will improve our sun and moon lighting. Unfortunately, the shader compile times were making further development counter-productive until his new and improved computer arrives next week. In the meantime, he’s shifted gears to begin work on sound LODing. This will make the audio engine happier, and will allow dB to do more with audio. WIP – Mages: The work going on now involves making a plan from both a technical and an artistic perspective. Mike is going through the VFX list, coming up with a breakdown of his approach. Tyler and Scott are revisiting the old “shared” cast animations so we can prototype sooner. Technically speaking, we’re identifying the extra functionality the VFX system requirements, as well as making sure that the new skills can be supported. Once this is done, Ben and Mark will do another evaluation of the classes, and if that goes well, we’ll certify them as ready for development. Once that begins, Ben and Mark will do a class presentation for them. Tech – Arrow Projectile Improvements: Arrows will now no longer shoot through your face if your target is behind you. They now use a cone in front of your character as their launch area. a. Updated Male and Female Topology and Proportion Improvements: We completed a crucial step this week with the approval of the new male character rigged for animation. This clears the path to updating the current armor models with standardized guidelines. All of this work sets a better foundation for more armor, races, and animations! b. Armor, Weapon, and Hair Guides: When not supporting Joe, Jon spent the week collating all our assets to create guides to both document our process and solve issues we have not yet tackled. We’ll first audit our workflows and guides in-house, and then use them again later when we outsource some of our art. Art – WIP – Animation 2.0: This item covers some of the improvements we made to the style and timing of the animations used in Beta 1. The next steps involve updating and improving the old work, and better support of variable timing of abilities with shared animations. a. Animation Prototyping: Scott updated our timing prototype with an extra recover position at Ben’s request. This further supports the variable timing needs of the game’s design. We can now move forward with updating the existing animations, as well as updating the old weapon animations we didn’t use in Beta 1. The first phase here is shared weapon animations among all the classes to support testing of the ability system. Once that is complete, we can look at creating class-based unique animations. b. Animation Blending: After a bit of sleuthing and prototyping, we realized that we need to update the blending functionality of the animation system. Once Andrew is able to make those changes, we can reduce the time it takes to complete several of our animations and can better support sharing of animations as well. 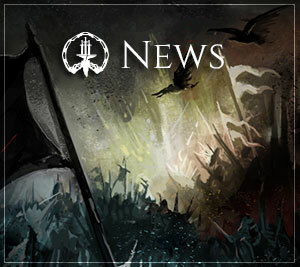 c. Updated Polearm Animations: Sandra is updating the old animations to the new styling and timing changes. This new approach takes less time and leads to animations that look better than the old ones. 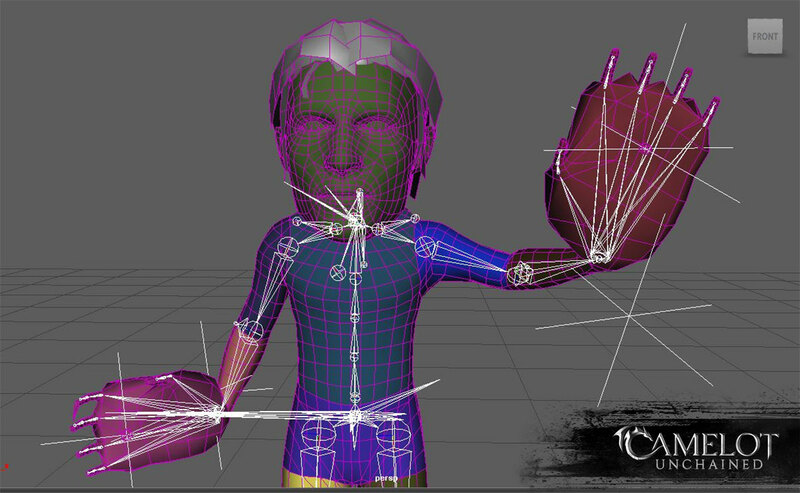 d. Animation Retargeting Investigation: With the approval of the new rig, Joe is investigating the work involved in re-targeting our animations to the updated skeleton. Defining this process is very important, as it will inform how we support our planned races that are not strictly humans. Tech – Statuses and ActiveEffects: Christina has submitted for review a change in the relationship between Statuses and ActiveEffects. A status can now hold as many effects as it pleases, and doesn’t specify who it targets. This allows for us to reuse a lot more data, and makes scripting easier, since it enables removing entire chunks of related scripting. This will speed up the creation of new classes and skills. 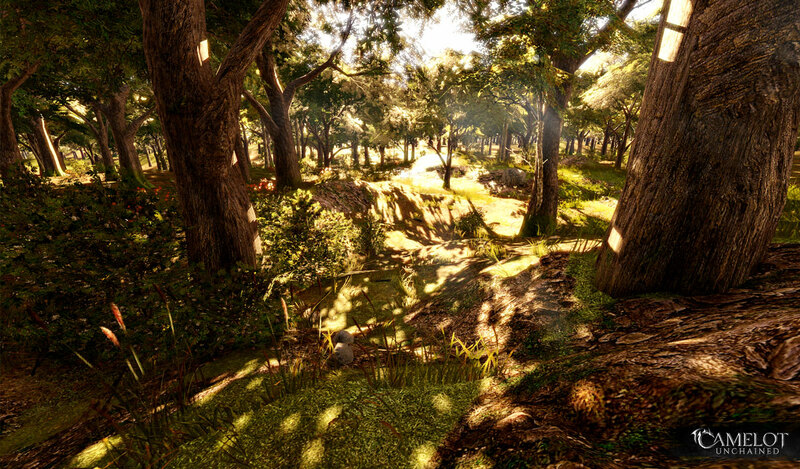 Art – Environment – Deathmatch Map: Dionne finished “arting up” the spawn points on the Deathmatch map, and is currently updating the forest mod on the map to be a bit denser, with some of those smaller touches that add a bit of life. While doing this, she’s also creating a few new assets and making poly reductions to improve performance. WIP – Tech/Art – Crafting UI: As mentioned last week, we’re doing an extensive overhaul of the crafting UI to better support the crafting design. With an approved wireframe, both Michelle and James have been working on the art and styling this week. AJ has been working on the behind-the-scenes functionality. We want something easy-to-use that also visually conveys the spirit of the crafting system. Like I said, we’ve got a lot of things in progress right now. For me, the animation prototyping has been one of the more difficult–yet fun–things we’ve been working on. Let’s move into some art for the week, which is a little less than usual due to all the planning and prototyping that the art team is doing. Before Beta 1, Dionne spent much of her time helping me (Tyler) create assets and get them into the home islands. She didn’t get much time working with the terrain editor. 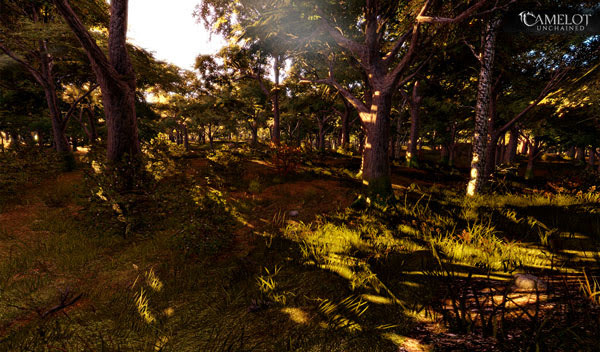 This week, she clearly found her groove again, creating this forest mod which will be used on the Deathmatch map. Good job! 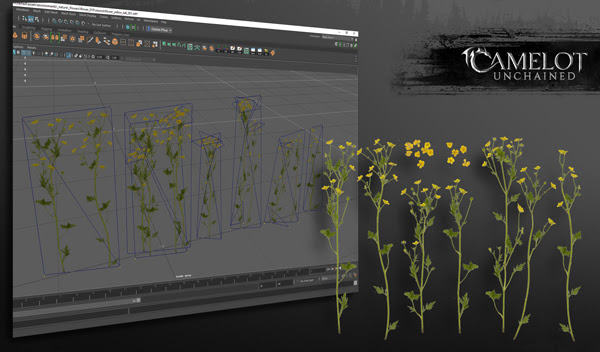 Next up, we’ll begin planning out new environment art to make! Dionne felt this forest needed some yellow added to it, so she quickly started making some new flowers. It’s amazing what you can do with only a few triangles! In our game, to support our huge battles, we have to be very clever with our art. Here’s a few concepts Michelle has been working on for possible crafting UI treatments. I’m particularly excited about our crafting system as it relates to the creation of the weapon and armor art. And that’s the end of this week’s update! As mentioned above, we’ll have another email going out to IT, Alpha, and Beta 1 Backers about this weekend’s test.